One fine week in late October of 2006, on five successive days I had cause to upbraid some loutish behaviour. Whether this was chewing gum in school, or pushing smaller people around or the umpteenth occasion of telling the same child to tuck its shirt in, find a tie, fasten said tie or even make space for others in a corridor, does not matter. The distinction that this week provided was that on each of five successive teaching days the last comment from the pupil was, basically,”What’s your problem?”. Once, I might take as cheek: five of them, from unrelated incidents and kids in different years, I take with credibility and begin to wonder if I do have a problem. On the last day of term we all receive letters explaining that there need to be some redundancies in the teaching staff 2. Would those willing to consider this please put themselves forwards. My response is immediate. I have seen forced redundancy and the result is not uncommonly that the recipient is given such a blow to their confidence they do not work again. A vow taken at Shiplake demands that I offer myself – and it may well solve my issues with teaching. Eight to twelve weeks later we have agreed that the school can lose a mathematician permanently (I’ll have them in court otherwise), we have agreed on a sum less than I want and more than the school wants and I find myself very comfortable with the decision. My colleagues only thought and dithered³ and now realise that I really am going. The news slowly percolates through the school and by the last six weeks everyone knows I am going, and going happily. I spend late January and the first half of February looking for jobs. I look for teaching jobs abroad only because it is the right time of year for the adverts. I look at English-speaking jobs in any part of the world. Effectively I shall be retiring – my financial advisor keeps on saying I could do that – so any income will avoid expense and I am keen to ascertain the extent of my wanderlust and my capacity to live outside the UK. I am emailed by a company in China, and a telephone interview ensues, resulting in an offer. The second interview raises the stakes and confirms my commitment. At Easter, instead of going tripping around Europe, I think it wise to go have a look at what I am letting myself in for, and this proves a wise decision. I pay the flight fare and the company pays all the hotel bills, makes me feel very welcome and spends large amounts of time showing me around the school, informing me about their ethos and objectives. I spend most of a week at the school, which is still in term, and go round listening to people in a way reminiscent of my days as a management consultant. Several issues come to light and some result in suggestions that are grasped with an embarrassing enthusiasm. One such is the chronic shortage of textbooks. The paucity of textbooks in China, followed by an offer to clear out the ‘old’ ones from Plymouth, puts me in a situation where I may as well use the move of books to excuse moving lock, stock and barrel to China. I contact six removal companies over the internet. Only one replies, a Crown International. I know that what counts as a big firm in Britain is small fry internationally and it appears that Crown is a fairly large player. A representative comes to visit on a day with inoculations booked. The three-hour gap should be enough, but he is caught by Glastonbury traffic and arrives late. Late enough that I need to go have the jabs I have booked before we have really finished. I offer him the opportunity to stay and complete his schedule more slowly – I will only be twenty minutes – but he declines and I chase him away feeling we have probably said enough but I wanted time to think of new things to make clear. I was quite certain I had explained my objective, to have my stuff in China shortly after arriving there on 1st August, that therefore time was of the essence. He leaves me a pile of paper that tells me little I didn’t already know, but it is good confirmation that they know their business. I have to chase Crown repeatedly to set a date for removing my gear and we reach a point where they suddenly grasp what I have been saying and the stuff disappears on June 18th, a week after them telling me. The gap between the first visit and the removal is of the order of six weeks. I am thinking the boat will take six weeks and so 18/6/7 is about as late as it could be. I end up asking whether they think the stuff is leaving Plymouth on August 1st and it may be that the message was garbled. If so, that was entirely internal. My emails were very clear and unambiguous. So I have six weeks left in Britain with the gear that has not “gone on the boat”. This takes planning and I don’t have it entirely right. I then discover the tiny amount of permitted luggage and spend the last days of July sending the surplus by air freight for £200, which works out as ‘only’ twice the sea freight rate. This arrives in four days and I collect it from the company office on arrival in Xi’an. The cost of the sea freight works out that, despite original message to the contrary, the cheapest way will be for me to book a whole container (if I had known this I could have arranged a sharing with a fellow new colleague⁴). As such I may as well do my best to fill it, so everything but the car becomes liable for packing. I now know I should have been more literal with that interpretation and even packed bedding and furniture. Once committed to a container, the volume has little effect on the price. We are looking at £4000. This is payable up front (not clear at the outset and a point of contention, but they now have my stuff and I feel conned). The insurance rate is 4% of the value. While that comes to another £1000, my thinking is that 4% is high and therefore suggests there are many claims, and many grounds for such claims, so I want to insure my goods. I am also thinking that if I had known this earlier, I might not be doing this at all. Allow another £1000 to cover import duty, definitely not understood, and we have a £6000 hole in the accounts. August goes by, now resident in China. It becomes clearer that the Import permit is an obstacle and I have written about that in 15 Wine into Water However, communication between my office in Xi’an (Xiaolan) and the Crown Beijing office (Cynthia⁵) is pretty good and we fulfil our promises in making the paper appear rapidly. It then transpires that my gear is still in Britain. Cynthia asks me to fire shots across bows for supply of paperwork, sent and responded with alacrity, but I cannot understand how it is that the goods have not been in transit. I was very clear about the required arrival. I was clear in understanding that the transit time was the time in which the Import Licence must be produced and clear that this length of time was acceptable and manageable. The only helpful and effective member of staff at Crown (besides the two removal men themselves) ‘has gone away’, perhaps for the school holidays6. At the end of September I am in a situation where I have now been three months with what I guessed would be appropriate for the first few days in a new country. Half my shirts are still too warm for the weather here and I have three sets of clothes. I have no textbooks with which to carry out my job, too little computing power and no furniture. Crown has failed to deliver, failed to communicate, taken no regard for promises made and largely kept me uninformed. The poor girl at the Beijing end is left trying to patch things up and is let down at every turn by the UK end. This is not a company with whom one wants to do business. Yet, among the ex-patriot community, it is agreed that Crown is one of the biggest players. I have since discovered that just a little more communication within our new staff would have saved several of us half my cost and we could have co-operated to reduce costs to a point where the company would pay for removal, simply by providing a single container among many of us. As it is, I am significantly out of pocket and the value of the books that were the point of the removal is fast disappearing as the term progresses. Time was of the essence of the contract. The information was not wrong but the promises were and are unfulfilled. I cannot see how I could have been clearer without the assistance of clairvoyance, and Clair is not known to me. 1 Precise English: I didn’t hand in notice, I told him I’d be looking to move. 2 The picture at the top was taken at the end of the term, after the Christmas party and after the tidying up. I was last to leave, perhaps, living in school and returning to the SCR for something, probably a futile ‘senior moment’ search for something misplaced. I found the scene as photographed and went back to my rooms for the camera. It seemed to me to sum up the situation with the new Head (a situation I now know, 5 years later, from some other perspectives). 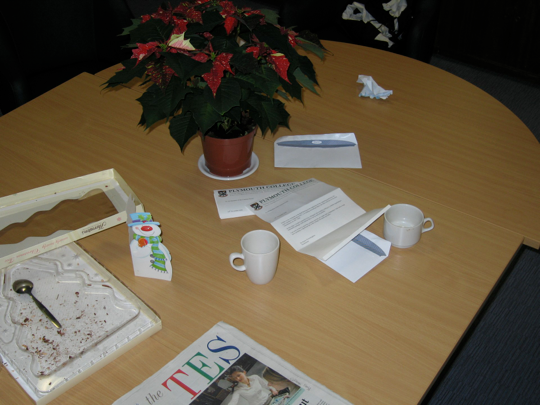 You have a pot plant present forgotten, residue of Christmas party cake, the letter inviting people to put themselves forward for something akin to redundancy—twice, each with a discarded cup—and the TES. I note that there is what looks like a third envelope on the table, plus some other paper rubbish on the floor. Presumably some motherly soul is going to tidy up the ‘tidying up’, not unlike tidying up after a teenager. 3 Colleagues who I thought better placed to take the voluntary redundancy all dithered and claimed to do thinking about this. They each had to be pushed by me into action – or its lack, as it turned out. I suspect it was easier for them to stay where they were than to face a change. By comparison, I was looking for change. 4 Unknown new colleague, but I could, it turned out, have found several. Last paragraph of the text above the initials explains. 5 Little did I know that this lady’s name would feature significantly in later life; this Cynthia was the first lady I met of that name and not the one I later married; both Chinese names and chosen English name matched! 6 But, in a very Chinese way, the words used could have meant that person was not ever returning to work at the company.